If you are a soup-sipping purist like myself, you probably pshawed the movement to sip your soup from a cup – which has risen in popularity since the mid 80’s. For those of us who prefer our soup in a bowl, being asked to take our soup in a cup was – If not the last straw – then at least hard to swallow. Well it may bowl you over to discover that the chalice from which we sip, Sunday by Sunday, may have begun its life as a bowl, too. In the early church, the final resting place of the most Holy Grail (the cup Jesus shared with his disciples at the Last Supper) was a topic of much debate and intrigue. In fact, in the sixth century, pilgrims on route to Jerusalem, were led to believe that the Grail rested in the church of the Holy Sepulchre. When they arrived, seeking the cup of Christ, they discovered a chalice, largely resembling the ones we see today; a lofty, ornate, silver vessel – except that it was fastened with two handles around its perimeter, much like any modern day victory cup or trophy. However, in the eighth century this would-be-grail was found to be of spurious origin, so the search for the Grail resumed. The next likely candidate was the Sacro Catino of Genoa, which legend had it was brought to Italy by James during his apostolic wanderings. Rather than being cup-shaped, this grail was an emerald and glass bowl measuring approximately fourteen and a half inches in diameter. However, this alleged grail was so opulent and costly that church authorities saw right through the hoax and it was excluded from consideration as the Holy Grail. That said, research into the life and times of Jesus suggests that the cup of the Last Supper may very well have been more like a bowl. After all, poor Judean peasants ate and drank with simple, uncostly, implements. To add further credence to the bowl vs. cup controversy, it is interesting to note that the term chalice (from the Latin calyx) can mean cup or bowl. Furthermore, the term grail is a garbling of the Latin word “cratalis” which refers specifically, and only, to a bowl. However, whether the chalice is or was a bowl or a cup is of little consequence. As with other sacred vessels, what is significant is not so much the object itself, but what it contains. 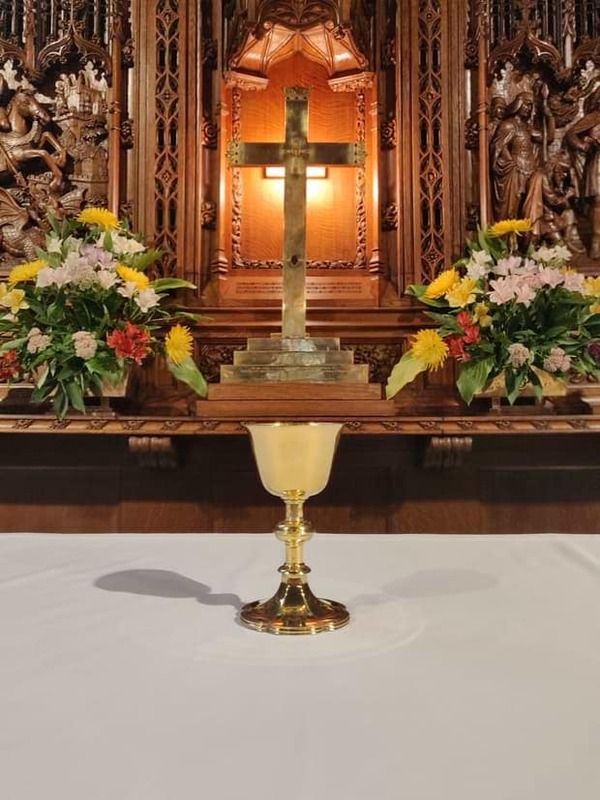 The chalice is among the most sacred of objects because we believe that it is nothing less than the cup of salvation; into which we pour the symbol of Christ’s blood poured out for us. As St. John Chrysostom once said: “The table was not of silver, the chalice was not of gold in which Christ gave His blood to His disciples to drink, and yet everything there was precious and truly fit to inspire awe.” Since his name “Chrysostom” literally means “the golden mouth,” I guess you could say that he knows not only of what he speaks, but from whence he sips. For a more comprehensive history of the chalice see The Catholic Encyclopaedia Online or “The Oxford Dictionary of the Christian Church” (Elizabeth A. Livingstone, Frank Leslie Cross Editors). – both of which provided some of the information for this article.